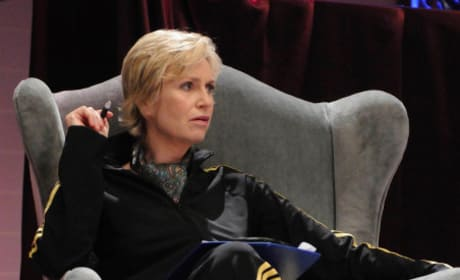 Sue is seen here directing The Rocky Horror Glee Show. In an unusual move, she's wearing a track suit while doing so. New Directions rock out in their Rocky Horror Picture garb in this photo. They look incredible, don't they? Sam Evans went shirtless for The Rocky Horror Glee Show. He's ab-ulous! Kurt dresses up as Riff Raff for a very special Glee episode. He and fellow group members honor The Rocky Horror Picture Show. Finn and Rachel practice their lines and songs in this scene. It's courtesy of the show's tribute to The Rocky Horror Picture Show. In character for their tribute to The Rocky Horror Picture Show, Finn and Rachel take to the stage here. Only Glee could pull off such an episode. This is yet another fantastic scene from the Rocky Horror Glee Show. It features John Stamos in the foreground. Will focuses on The Rocky Horror Picture Show in this episode because Emma loves that movie. He enlists the help of Artie and company. 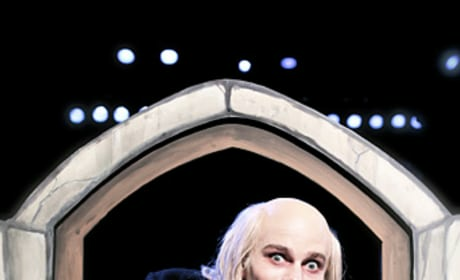 This is one of several amazing images from the Glee episode dedicated to The Rocky Horror Picture Show. Great attention to detail. Sam Evans is new to the Glee universe. He'll play a key role on The Rocky Horror Picture Show episode of the show. Yes, this really is a photo of Kurt Hummel. It's courtesy of the Glee episode dedicated to The Rocky Horror Picture Show. 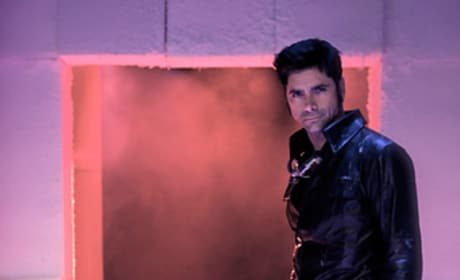 John Stamos is all dolled up in this photo from the special October 26 episode. It's based on The Rocky Horror Picture Show.